From Porec, we drove around the Istrian Peninsula. First we headed inland, away from the sea, and saw some of this lush agricultural region. The hills were covered in olive trees, apples and forests, in which the locals collect truffles. The many roadside stands sell bottles of olive oil, garden fruit and truffle products like truffle paste, truffle oils, dried truffles and preserved truffles. From the interior, we drove south to the old town of Pula. Pula is famous for having the best preserved ancient Roman coliseum in the world. All the walls and all the gate towers are original, and still in perfect shape. The thick stones that make those walls are placed in perfect arches and have proven to be impervious to the weather, earthquakes and the salt from the sea. We parked on one of the back streets of the city, and there we saw, for the first time, signs of poverty that we had not seen in all of our travels around Slovenia. There were temporary, rundown housing units, and gypsy kids playing in the streets. In this way, there are striking differences between prosperous Slovenia and Croatia. The Old Town center in Pula is very beautiful, with winding, narrow stone streets and lots of small shops and restaurants catering to the tourists. We saw some floor mosaics from the Roman era, and a beautiful Roman temple, along with beautiful architecture from the last few hundred years. Continuing our drive down the Croatian coast, for our next stop, in Opatija, I had booked us a room in a small luxury hotel. 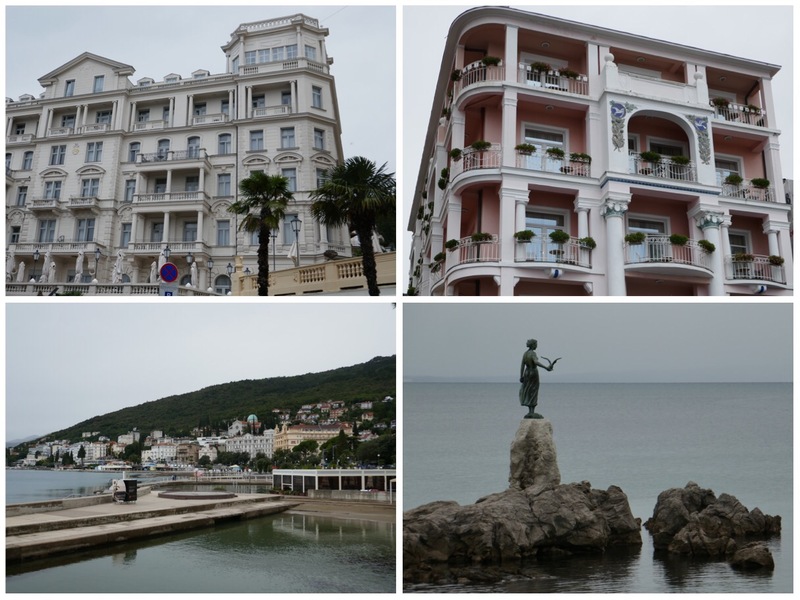 The city of Opatija is located right on the Adriatic Sea, and it has remarkably beautiful old hotels painted in pastel colors and surrounded by nice gardens by the sea. It was cold and rainy when we visited Opatija, and our hotel receptionist told us that last September it was so warm, you could swim in the sea every day. This year, September is chilly and we wore our heavy coats to go for a long walk along the sea. There is a long walking path along the sea and away from the cars on the road, which leads all the way south to Lovran, and all the way northeast to Rijeka. It is dozens of kilometers long, but we only walked a part of it, and eventually when our shoes and socks got soaking wet, we took shelter in a cafe and returned to our hotel for a hot shower and to change for dinner. Luckily, the weather pattern had improved and just a few days after our rainy walk in Opatija, we were enjoying the sun, wearing summer clothes and sandals. Our luxury hotel had a wonderful breakfast with an impressive array of locally baked pastries, handmade cheeses, homemade jams, fresh and tasty whole grain breads and even caviar. Because of all the lovely hotels, there are lots of good dining choices in Opatija. We chose a bustling and busy spaghetteria in the middle of town. One night we ate their truffle pizza, which was divine, and the next night we ordered their homemade pasta, which was less than divine, but they also made us a fabulous ruccola salad, which was very good. Despite lots of other places to eat, it seemed like everyone in town was eating at this one place. We skipped desserts and bought a few superb handmade chocolates with all sorts of brandy and liqueur fillings in one of the chocolate shops in town. We are getting into the rhythm of the trip, enjoying moving from city to city, walking as much as we can and staying in fabulous apartments and hotels. With only a few exceptions, the apartments we’ve rented have been truly beautiful, renovated with great care and a lovely sense of design. In fact, some of the apartments have been so fabulous, that they felt as good or better than any five star hotel I’ve ever stayed at. I love having unstructured days, in which the only goal is to have fun, see beautiful things and spread kindness and joy all around us.